Nature's Gate, a trusted alternative for healthy hair. Your cleansing routine just got more responsible. Our Awapuhi Ginger & Holy Basil Shampoo gently cleanses hair with a unique blend of Awapuhi Ginger, Holy Basil and Wild Cherry Bark. Ideal for oily hair. 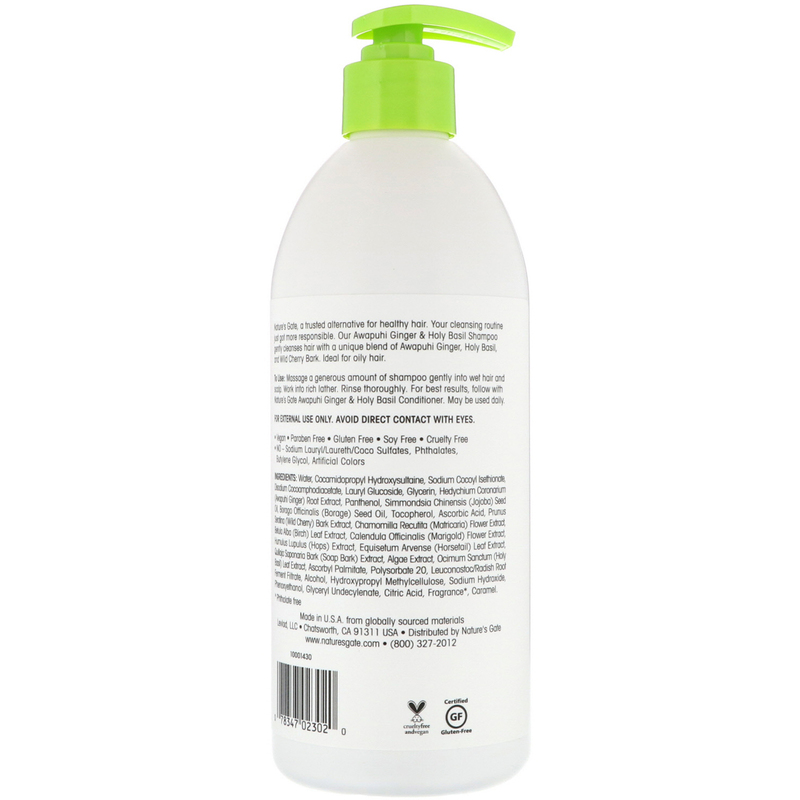 Massage a generous amount of shampoo gently into wet hair and scalp. Work into rich lather. Rinse thoroughly. 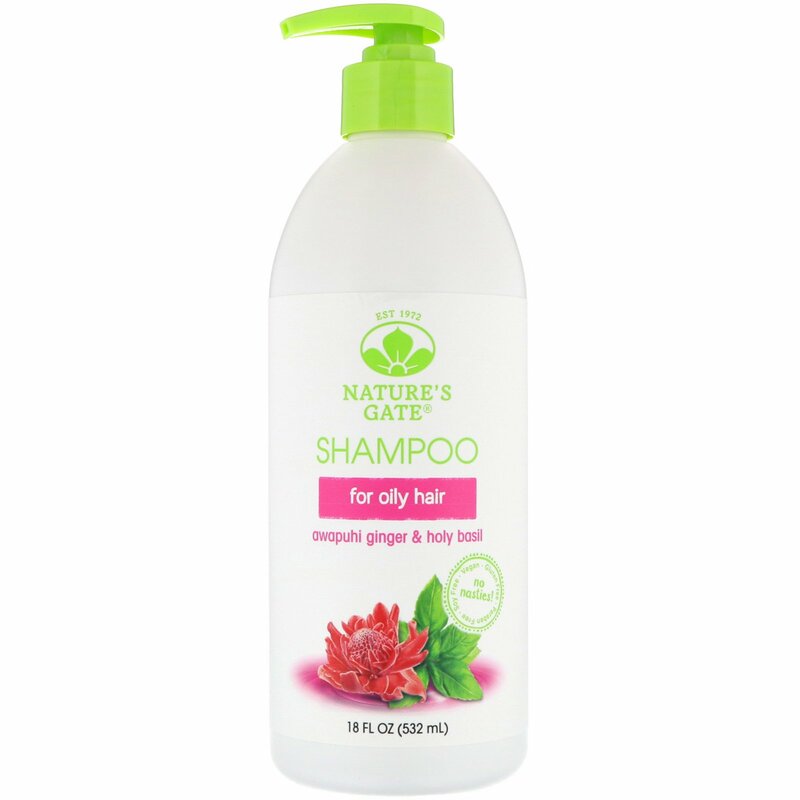 For best results, follow with Nature's Gate Awapuhi Ginger & Holy Basil Conditioner. May be used daily. Water, cocamidopropyl hydroxysultaine, sodium cocoyl isethionate, disodium cocoamphodiacetate, lauryl glucoside, glycerin, hedychium coronarium (awapuhi ginger) root extract, panthenol, simmondsia chinensis (jojoba) seed oil, borago officinalis (borage) seed oil, tocopherol, ascorbic acid, prunus serotina (wild cherry) bark extract, chamomilla recutita (matricaria) flower extract, betula alba (birch) leaf extract, calendula officinalis (marigold) flower extract, humulus lupulus (hops) extract, equisetum arvense (horsetail) leaf extract, quillaja saponaria bark (soap bark) extract, algae extract, ocimum sanctum (holy basil) leaf extract, ascorbyl palmitate, polysorbate 20, leuconostoc/radish root ferment filtrate, alcohol, hydroxypropyl methylcellulose, sodium hydroxide, phenoxyethanol, glyceryl undecylenate, citric acid, fragrance*, caramel.